The Trash feature allows you to delete items by moving them to your trash folder where you can restore it within 30 days from the time the item was trashed. This feature is designed to make it harder to accidentally delete posts, pages and comments. 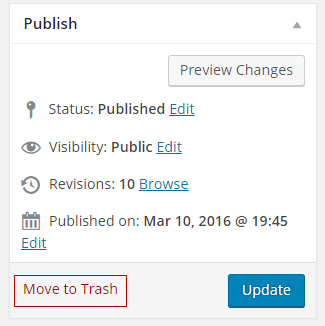 After the 30 days the posts/pages in trash are automatically permanently deleted. All items in your trash folders can be restored provided you restore them within 30 days of being sent to the trash folder. If a post/page is permanently deleted from your blog by another user it may not be possible to recover the item. All users need to be very careful when permanently deleting anything from your blog and you need to make sure you’ve assigned the correct user roles on group blogs. To minimize the risk of another user deleted content on a group blog we recommend that the main user of the blog is assigned the role of admin user and all other users are assigned the role of Author or Contributor. Authors can publish own posts but can’t edit or delete another users’ posts or pages. A contributor can only submit posts and pages pending review by an admin user or editor and can’t edit or delete another users’ posts or pages. Please contact Edublogs Support if you need help recovering an item that has been permanently deleted. If you accidentally deleted content from your editor while writing a post/page you may be able to restore using the Undo command. Undo may not work for every situation. If you’ve regularly clicked Save Draft or Update you may be able to restore using Revisions.